It does not matter how true the truth you present from the pulpit, if you bore people with it, then you are doing damage. 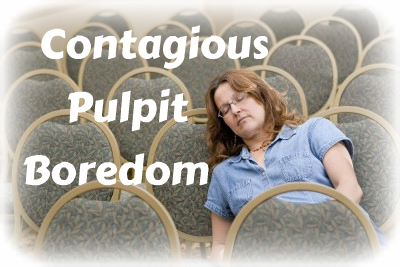 Too much preaching is boring preaching. Sometimes it is due to the content, sometimes the delivery, sometimes the attitude, sometimes the preacher’s own personality. Whatever the reason, it should not happen. 1. God is not boring. Actually, God as a concept presented in a lot of theology has become personality-free. For many, He has essentially become an It, definable by a set of truth statements, but essentially unknown in his personhood. God has a personality. Our role as preachers is to pursue Him and chase Him and long to know Him more, so that we can represent Him effectively. 2. The Bible is not boring. How many classes and sermons and story times and lectures and presentations have turned the vivid and gripping self-revelation of God in His Word into a dull set of archaic moralistic tales? Sort of a set of ancient fables without as much of the talking animals as we might prefer. But the epic sweep of Scriptural history, the diversity of genres, the human personalities and the divine personality, the issues to wrestle with, the irony to catch, the pain to feel, the exhilaration to experience, and so much more . . . there is no collection of books like this one! Tomorrow we’ll add a couple more factors and try to get to the root of the issue: Why is some preaching dull?